An emergency vehicle drives through a neighborhood in Rowlett, Texas, on Dec. 27, 2015, the morning after it was struck by a tornado. 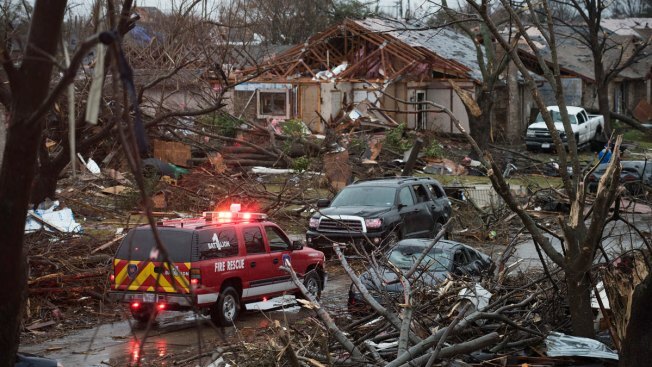 At least 11 people died and dozens were injured in apparently strong tornadoes that swept through the Dallas area and caused substantial damage. The New Hampshire-Vermont region of the American Red Cross is sending two people to help people recover from devastating flooding and tornadoes in Texas, Louisiana and Mississippi. Red Cross staffer Dan Lavilette of Burlington, Vermont, is scheduled to leave Saturday for Alexandria, Louisiana, to work as a client casework manager. He will help create recovery plans, navigate paperwork and connect people with resources. Volunteer Lynne Bernard of Bedford, New Hampshire, is headed to Beaumont, Texas, as a disaster assessment supervisor. Lynne will work in communities assessing damage that will begin the process of assistance for affected properties. They join Red Cross workers from across the country in response to the floods and tornadoes. Their deployment will each be approximately 2 weeks.